Since our founding in 1995 fighting for adequate and equitable school funding has been central to our work. 1000’s of Philly Student Union members have lobbied and rallied in our state capital Harrisburg. Since 1995 we’ve organized dozens of school funding actions. In 2004 over a dozen members of the Philadelphia Student organized and participated in a 110 Mile Walk for Educational Justice from Philadelphia to Harrisburg.The students were joined on their walk by Philadelphia Mayor John Street. The walk concluded at a rally in Harrisburg with over 1,000 people from across the state demanding more adequate and equitable school funding. In November 2007, the state released a “Costing-Out Study” which determines how much money it would actually take to educate every student in Pennsylvania. The fact that the state conducted the study is an organizing victory in and of itself that was the result of many years of pressure to do so from education advocacy and organizing groups. We’ve always known that Philadelphia public schools are under-funded; the study determined that out of Pennsylvania’s 501 school districts, 474 (90%) are not provided with resources adequate to meet their students’ needs. This illuminated the fact that school under-funding is not only a Philadelphia problem but a state-wide problem. The results of this study form the basis of PSU’s strategy, which is to create a peer-to-peer network of students across the state who can mobilize and agitate for a new funding formula that will finally address the inequities in the way our schools are funded. 2011 The election of Republican Governor Tom Corbett in 2011 has seriously hindered our work around state funding, as he has pledged to model himself after Chris Christie of NJ and slash statewide education funding and other social spending. Governor Corbett and the state legislature have cut almost a billion dollars in education funding in Pennsylvania with over 300 million coming out of Philly public schools. The governor and the republican controlled state legislature have made it clear that public education funding is not a top priority. 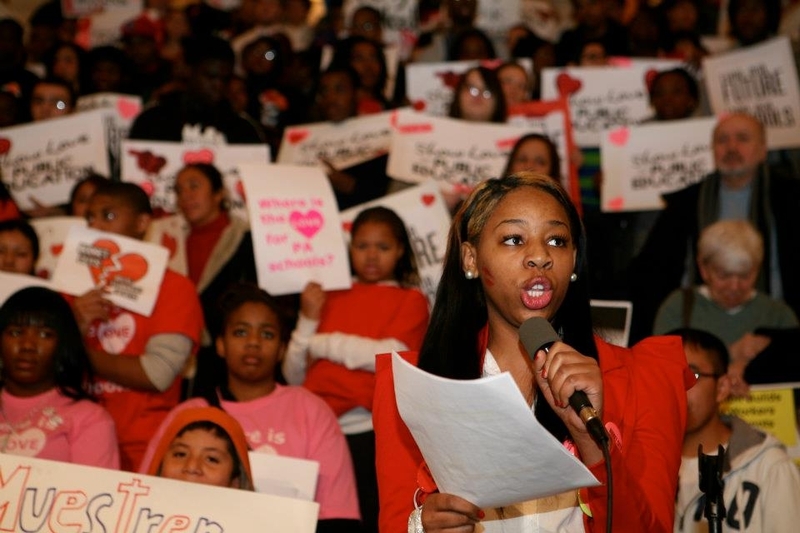 On February 14th, 2012, Philadelphia Student Union members organized a 500-student and parent state-wide rally in Harrisburg. We worked with other high school students in Chester, Pittsburgh, and Reading to plan the rally, organizing students through an educational and leadership development process. This included: student-led workshops about how schools are funded & the history of school funding inequity in PA, dialogues about the effects of last year’s budget, workshops to develop core messages & branding for this action, trainings for public speakers & press spokespeople, preparing for legislative meetings, trainings for us to become ‘Tactical Team’ members, executing the logistical elements of the action, debriefing the action & strategic discussion of next steps. The rally strengthened our statewide network of student advocates for adequate school funding. We met with head of the House Education Committee Rep. Clymer and Sec. Education Tomalis’ office. There have numerous attempts in Pennsylvania state legislature to pass voucher bills that would take money from public schools to fund private schools. While voucher bills have been unsuccessful, the PA house passed House Bill 2468 on June 13, 2012. HB 2468 gives businesses tax credits for donating money to scholarship funds for private schools. Many of these scholarship funds are managed by politically connected organizations and many of the scholarships go to students already attending private schools. This is a de-facto vouchers bill that diverts money intended for public schools to private schools. On June 23rd, 2012, along with parents from Action United, we coordinated a ‘No Vouchers Tour’ to 3 state legislators offices. During the tour, Senator Farnese’s office made its first public statement against vouchers. During the tour, students, parents and community members presented State Legislator Roebuck with a Champion of Education Certificate for continuing to be against vouchers. The No Vouchers tour also held a rally in front of Senator Williams’ office to demonstrate that there is strong opposition to his consistent support of vouchers.